Here is a low-cost, invisible laser circuit to protect your house from thieves or trespassers. A laser pointer torch, which is easily available in the market, can be used to operatethis device. The block diagram of the unit shown in Fig. 1 depicts the overall arrangement for providing security to a house. A laser torch powered by 3V power-supply is used for generating a laser beam. 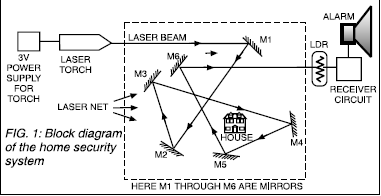 A combination of plain mirrors M1 through M6 is used to direct the laser beam around the house to form a net. The laser beam is directed to finally fall on an LDR that forms part of the receiver unit as shown in Fig. 2. Any interruption of the beam by a thief/ trespasser will result into energisation of the alarm. 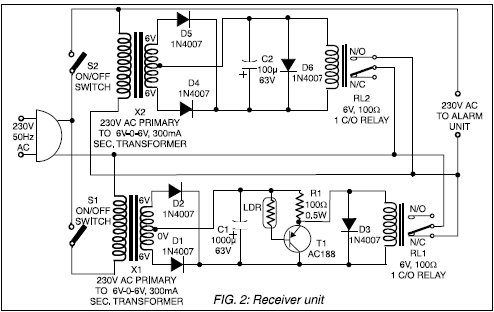 The 3V power-supply circuit is a conventional fullwave rectifier-filter circuit. Any alarm unit that operates on 230V AC can be connected at the output. The receiver unit comprises two identical step-down transformers (X1 and X2), two 6V relays (RL1 and RL2), an LDR, a transistor, and a few other passive components. When switches S1 and S2 are activated, transformer X1, followed by a full-wave rectifier and smoothing capacitor C1, drives relay RL1 through the laser switch. The laser beam should be aimed continuously on LDR. As long as the laser beam falls on LDR, transistor T1 remains forward biased and relay RL1 is thus in energised condition. When a person crosses the line of laser beam, relay RL1 turns off and transformer X2 gets energised to provide a parallel path across N/C contact and the pole of relay RL1. In this condition, the laser beam will have no effect on LDR and the alarm will continue to operate as long as switch S2 is on. When the torch is switched on, the pointed laser beam is reflected from a definite point/place on the periphery of the house. Making use of a set of properly oriented mirrors one can form an invisible net of laser rays as shown in the block diagram. The final ray should fall on LDR of the circuit. LDR should be kept in a long pipe to protect it from other sources of light, and its total distance from the source may be kept limited to 500 metres. The total cost of the circuit, including the laser torch, is Rs 400 or less.